Luis Perdomo pitched three scoreless innings in his final start of the 2018 season. 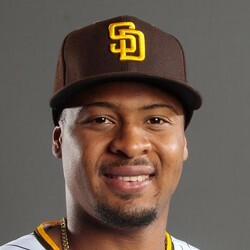 He received the no-decision in the Padres' 3-2 victory over the Giants. Perdomo had a rough 2018 he is 1-6 with a 7.05 ERA, 1.88 WHIP and 39 strikeouts in 44 2/3 innings. Perdomo's extremely high WHIP is not explainable by logic. He had an alarmingly high BABIP of .392. In his career he has a great .81 HR/9 which should help keep his ERA down in the future. Perdomo is entering his age-26 season in 2019 and should look for a big rebound.